I love eggplant of any shape, color, or size, and in fact I have many, many recipes I use often that feature eggplant as the main ingredient. This summer I fell in love with the Rose Bianca Eggplant which is sort of round, or pear shaped, and purple and white in color. The best thing about this eggplant though is the flesh which is very creamy white, almost sweet in flavor, and is never bitter. I cooked a number of dishes with this lovely eggplant the past few months, but the one I think we probably enjoyed the most was the one I am sharing here. I cut my eggplant into wedges or “steaks”, dipped them in eggs and then coated them in a breadcrumb mixture. I then baked the breaded eggplant slices using just olive oil spray and they ended up crisp and golden brown on the outside with a creamy interior. 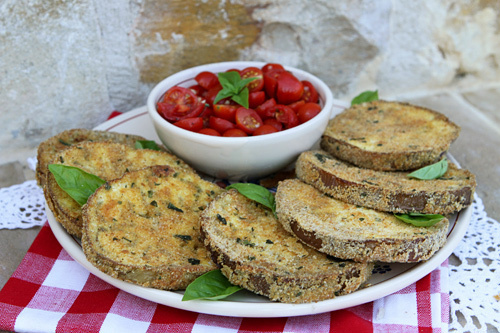 The eggplant slices have the crisp texture of being fried, but instead are baked in the oven using very little fat. To serve my eggplant I simply toss halved sweet cherry tomatoes with olive oil, minced garlic, salt, pepper & basil. We enjoyed this dish many times this summer and I served it as an appetizer, a side dish, and even a light lunch entree. If you cannot find the lovely Rose Bianca variety of eggplant, the regular American type will do as well. Just be sure to choose very fresh, smaller sized eggplants which tend to be less bitter. I have added a splash of balsamic vinegar to my tomato salad as well which was in fact delicious, so do give it a try, but I found after making this recipe many times I really preferred the simplicity of the sweet flavor of ripe cherry tomatoes on their own. By baking the breaded eggplant slices in the oven with just minimal olive oil spray you obtain the texture and flavor of fried eggplant with much fewer calories. 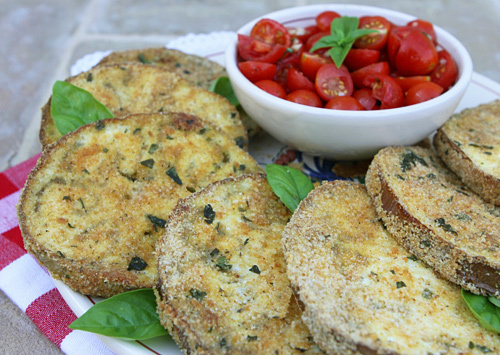 Oven "fried" eggplant steaks are topped with a fresh tomato salsa. In one bowl beat the eggs and milk. In a separate bowl mix together the breadcrumbs, grated cheese, parsley, salt, and pepper. Cut off the stem and bottom ends of the eggplant and then slice it crosswise into 1/2 to 3/4 inch slices. Spray two foil lined baking sheets with a little olive oil spray. First dip the eggplant slices into the egg mixture and then the breadcrumbs, pushing gently with your fingers to help the crumbs adhere. Place the slices side by side on the baking sheets. Continue to bread all of the slices in this manner until they are all coated in crumbs. Lightly spray the tops of the eggplant on the trays with olive oil spray and then bake 12 minutes. Turn the slices over and bake another 12 to 15 minutes or until the slices are golden brown but tender when pierced with the times of a fork. While the eggplant is baking, toss together the ingredients for the tomato salad. Serve the eggplant warm, or at room temperature arranged on a platter with the tomato salad either spooned on top or served alongside in a bowl.